SARA & ETHAN GROW ROOTS IN ST CROIX (and create Baby Taj): 'Providing shelter' - the roof. 'Providing shelter' - the roof. Its the fifth weekend of raising the roof. And the pictures are posted. I thought it would be interesting to all of you (and myself included) to really understand (in laymans terms) what is going on. So as Ethan and I are sitting here enjoying a quiet evening off (this is a rare occurance), I would like to show you what has happened on this amazing roof that is going up before our eyes! The slideshow link is posted below. Week 1 - Measured and squared and figured out the layout of the roof. 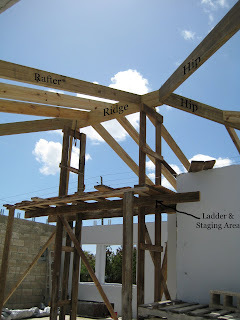 Built ladder and ridge beam. Week 2 - Installed hips and common rafters. Week 4 - Finished rafters and east side fascia. Week 5 - Finished fascia and installed bond beam forms. I use the word 'week' loosely because for those of you that don't know, Ethan also has a fulltime job. He works on the house on weekends with Bill and Fernando and every day after work he works on the house, runs errands and prepares for the weekend. While Ethan was working on the house, Steph and I took a long weekend trip to Florida. We got to see my mom and grandma and a few, not nearly enough relatives. It was mainly a shopping trip with a wedding focus. So, we had a lot to do and I am sure my relatives will understand because they'll be coming to visit us soon!! And of course, we ate a ton - Thai, Japanese (I can't believe you can get sushi in Target! ), lobster (me, not Steph), steak, artichokes and our favorite store was the little Asian market so we could come home with Thai curry pastes and miso soup mixes and Vietnamese spring roll wrappers. That's us back on St. Croix with our over-allotment of luggage. Mind you, we both went north with empty bags. This 6 foot alligator was on mom's lawn and she called the Fish and Wildlife. Click the slide show below to see the full album.